Many avid golfers live in areas where bad weather can prevent them from getting out on the course. For years, this was accepted as part of the game of golf. When it’s too cold, rainy, snowy, you simply can’t play golf. However, a new age of indoor golf with a golf simulator has changed all that. Early golf simulators first appeared in the early 1970s. The idea developed from placing computerized sensors at different points on nets that were used to practice. Hitting into a net offered little more than a way to hit a golf ball and control where it flew. There was no way to gauge distance or accuracy. The invention of computerized sensors began to change all of that. It was discovered that strategically placing microphones around an impact screen the sound of impact could be measured. While the measurements were average at best, a reasonable landing spot of a simulated golf ball could be estimated. Since the earliest golf simulators, new technology as evolved that calculates ball spin, axis of exit from the point of impact and trajectory. From the early beginnings as a fabricated indoor driving range, players can now play indoor golf with a golf simulator as if they were out on the course. The technical advancements have turned a practice tool into a way players can experience a full round of golf without ever leaving a room. Optical sensors employ infrared technology to track your golf ball as it passes these sensors. These advancements make it possible to pinpoint the exact XY coordinate where a ball would land. This makes it possible to do far more than simply practice your swing to see how far and accurately you can hit any particular kind of shot. You can now hit a variety of shots using different clubs and still get a very accurate readout of how well you’re playing. By incorporating each of these various computerized ball tracking technologies, today you can essentially play a full round of golf indoors. Software has been developed that will allow you to play a variety of internationally recognized golf courses. One of the most dramatic changes in indoor golf on a golf simulator is the idea of putting. Advancing many of the same concepts used to develop simplistic putt-putt simulators, GOLFZON, the simulator manufacturer of Swing Zone Golf, is far ahead in technology. 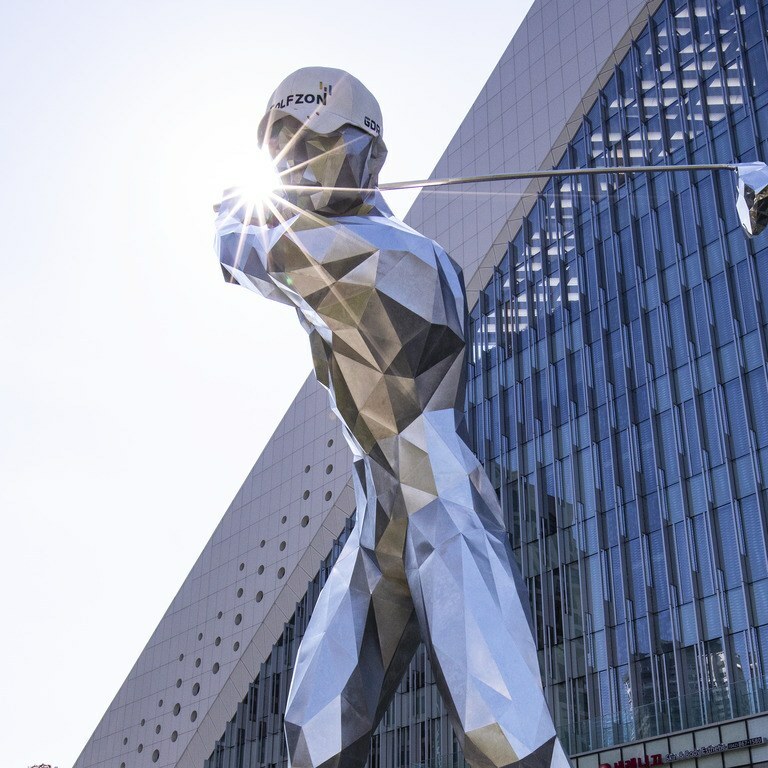 With its headquarters in Daejeon South Korea, where more “screen golf” is played than “field golf”, a previously employed executive from Samsung founded GOLFZON, incorporating retail shops, courses, and simulators. According to GolfDigest.com, “the drawback of simulated golf has always been short game, and in particular, putting. Golfzon’s solution is a tilting upslope of green carpet directly in front of the tee.” This relatively new technology uses a floor that shifts to emulate various angles and slopes of unique putting greens. Through this innovative software, indoor simulators are able to replicate any surface on a particular golf course from tee to green. Blending high tech consoles with elaborate camera systems and sensors allows players to enjoy a round of golf indoors, even if the weather outside is horrible. With this improved technology, you can feel like you’re strolling towards the 18th green at Augusta while standing inside a golf simulation room.